Welcome to the SPAG Zone! The SPAG Zone officially welcomes you to three of the most important areas of the website- the SPAG Coverage Grid, the SPAG Tests and COMING SOON: the SPaG Grid Online! The SPAG Tests have been incredibly popular and have been viewed and downloaded many times. The option to purchase editable versions of the test has also been popular. As a result, I have been working on releasing a SPAG Coverage Grid using the most up to date Curriculum for the teaching of SPAG. Please do let me know if you believe there to be any errors and I will update the grid accordingly. 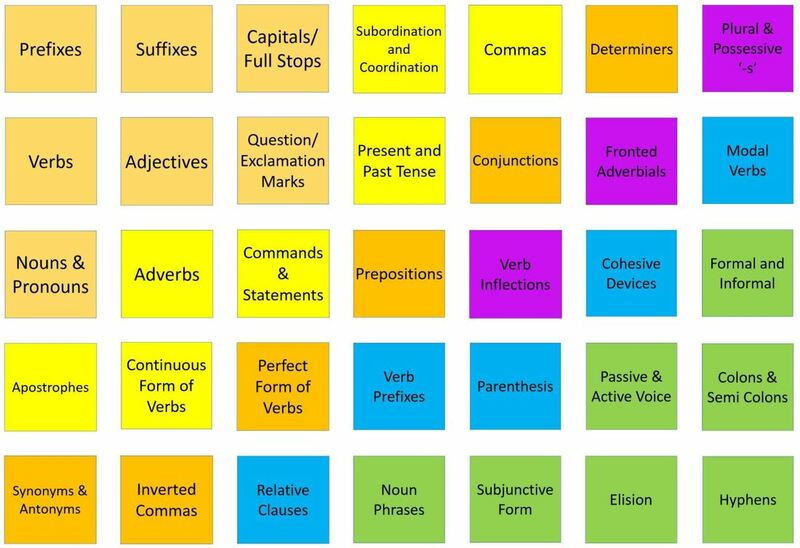 The grid has 35 areas to cover and although this is by no means an exhaustive list of all areas of the Spelling, Punctuation and Grammar programme, you will see that I have been reasonably thorough. Please click on the images below to take you to the relevant menus to find out more about both of these resources. All 35 elements of the SPaG Grid are now online! They are just being populated now! The SPaG Grid is coming online! With more resources than ever! Later this year, the SPaG Grid is going live online. At present, the original SPaG Coverage Grid is a manageable document at 70 pages. It has been very popular over the last year. However, in order to bring more resources and ideas, it was felt that a Powerpoint would not be the ideal place to hold all of this content. The internet is a much better medium and I look forward to bringing you a number of new and helpful resources to run alongside the improved SPaG Pages. You will be able to unlock the whole grid upon purchase (cost TBA), and will receive an interactive QR display for each of the areas as well as Progression Cards showing when each of the elements of the curriculum should be introduced in Key Stage 1 and 2. Until the full grid goes live, please enjoy the first of the 35 buttons... on Prefixes! Have a look around... there's a lot more to come in the next few months. Until then, please scroll down for more! Please only download this from a desktop computer. The SPaG Coverage Grid is not yet compatible with phones or tablet devices. At the end of your transaction, please ensure you click 'Return to Merchant' to access your download. If you are not directed back to this website after clicking on 'Return to Merchant,' please contact me straight away. If you don't get the option to 'Return to Merchant' at all you will not receive a link unless you contact me. I'll be more than happy to help. Do not make another purchase. I will respond to your email within 24 hours (usually much less) with a link to the download. I will be able to match the name in your email with the payment made in PayPal. Thank you! This area is due for an update soon, but please check out the existing pages for spelling here at KeyStage2Literacy.co.uk! I would like to remind all visitors to this website that all pages on this site are copyright protected, unless stated. Where content has been used from other sources (namely the DSCF, DFES or DFE), I take no credit whatsoever. Most importantly, this site is for the use and enjoyment of all children, parents, guardians, carers and teachers who are involved in Key Stage 2 Literacy. Please use the resources/ideas as you need without replicating them for your own gains.